Mike Church '05 started valiantly: "You, Junior, want to be the master / of a man-made, unnatural disaster / that's war, and you're a big fat whore / to the corporations / you sell out the nation..." It looked as if the left-wing spoken-word poet was guaranteed a win in this unprecendented free-style rap battle between himself and George W. Bush, the 43rd President of the United States. Yet surprisingly, Church was utterly defeated in this epic face-off. The battle occurred outside Sayles-Hill at roughly 4:45 pm last Wednesday, and was witnessed by more than a hundred and fifty Carleton students and Secret Service agents, as well as the entire CNN viewing public. While the event was short, witnesses have described it as 'intense', 'brutal,' and even 'sickening.' According to spectator Jean-Christophe Moran '06, "the Prez was unstoppable. He showed no mercy on Mike. The overkill was horrific." Dr. Charles Ansell '04 concurred. "Church is a good guy and all," he said, "but that dog got splattered on this one." An anonymous professor agreed: "Even his Real Analysis skillz were of no use to him here. 'Dat kid was D.O.A." Over the course of the next forty seconds, the President proceeded to (1) make fun of Church's hat, (2) bring up Mike's "sketchy" freshman year, (3) remark upon the length of Mike's "Scud", (4) mispronounce "nuclear" and (5) use the word "poopy". Shocked by the vicious reprisals the President offered up, Church's jaw dropped in abject defeat. Seeing his opponent wither under his attacks, Bush shouted: "I'm 'da real dawg on this campus!" The President's victory was decisive. Experts believe that Church's bruised ego will take months, if not years, to heal. Church's ego, formerly at a robust Senator size, has been reduced to that of a mere Elizabethtown school-board member. The damage may be irreversible." 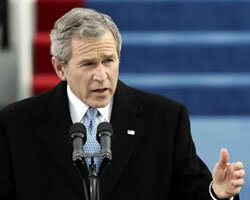 After slaughtering Church in the free-style battle, George W. Bush proceeded to yell "Thank you all for your support! Vote Republican in 2004!" poopy, don't mess with the big boys, we're the patriarchy!